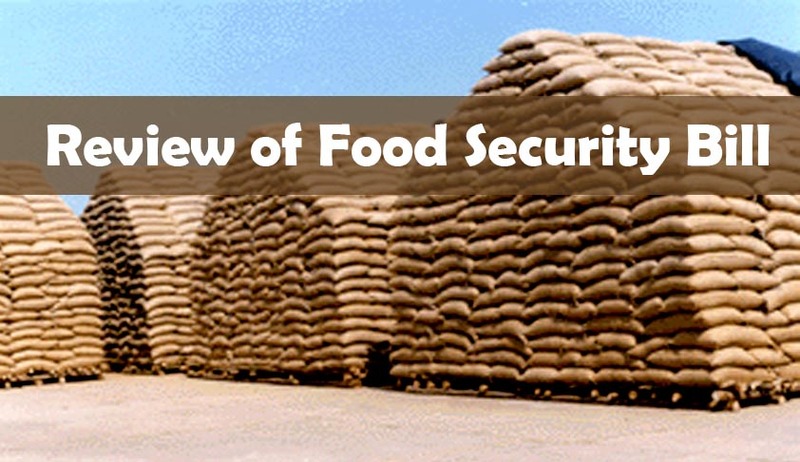 The Food Security Bill, 2011, one of the key legislations introduced by the current UPA government, is a project which, if implemented in the right manner, has the potential to eliminate endemic hunger in the country. However, since the time it has been introduced it has received a lot of flak. It is being seen as a mere reshuffling of the prevalent Targeted Public Distribution System (TPDS) having missed out on an opportunity to plug the loopholes in the existing system. The Global Hunger Index ranks India as 65th among the 128 nations surveyed and classifies it as a country with “alarming” levels of hunger. That too, when piles of food grain are made to rot and decay in Food Corporation of India (FCI) warehouses. It is in this context, that a “right to food” through food security legislation assumes significance. Article 25 (1) of the United Nations Declaration on Human Rights, 1948 (UNDHR) and Article 11 of the International Covenant on the Economic, Cultural and Social Rights, 1976 (ICESCR) recognise the right to food of every individual enjoining ratifying states to take measures to fulfil this right. Article 47 of the Directive Principles of the State Policy stresses on the issue of one of the duties of the State being to raise the nutritional levels in the country. The jurisdiction under Article 21 also recognises adequate nutrition as one of the inalienable components of right to life. The Food Security Bill is the State’s acknowledgement of the fact of having reached a point where every individual has a right to be free from hunger, if not enjoying a right to food. In 1997, the Government, faced with budgetary difficulties and evidence of the marginal effect on household nutrition and welfare, removed the universal entitlements of the country’s food distribution program and introduced TPDS. The TPDS constitutes India’s largest anti-poverty program, claiming as much as 36% of India’s total expenditure on poverty programs and social expenditure. The intended effect of the TPDS was not realised as it resulted in only a marginal increase of the average caloric intake of the poor, primarily a consequence of the very small population of the poor who availed themselves of the TPDS and the substantial shortfall in the quantities of subsidized food grains actually purchased relative to entitlements. In fact, the discrepancy between intended and actual benefits under the TPDS exceeds that under the universal PDS. However, major flaws surfaced as far as implementation of the scheme was concerned; the first one being the issue of targeting errors. Separating beneficiaries of the TPDS into three categories required substantive classification and identification. However, targeting mechanisms were prone to large inclusion and exclusion errors. In 2009, an expert group estimated that about 61% of the eligible population was excluded from the BPL list while about 25% of non-poor households were included in it. Another issue that needed to dealt with was that of large leakages and diversion of food grain. Food grain is procured by the centre and transported from the central to state godowns. Last mile delivery from state godowns to the Fair Price Shop (FPS) where beneficiaries can purchase grain with ration cards, is the responsibility of the state government. Large quantities of food grain used to be leaked and diverted into the open market during this supply chain. To plug such loopholes and many others, the idea of a Food Security Bill was envisaged. Unfortunately, the Bill has failed to address many such issues that the prevalent TPDS does not. The first major provision is that the bill covers 67% of India's total population - 75% in rural areas and 50% in urban areas. This population is divided into two categories: priority households and Antyodaya (poorest-of-the-poor) households. All these households are together known as "eligible households". Priority households will be provided 25 kg of food grain per month per household, while Antyodaya households will be provided 35 kg of food grain per month per household. Here, food grain is defined as rice, wheat, coarse cereals or any combination of these three. Food grain will be provided through the Public Distribution System (PDS) which will be expanded suitably for the purpose. The issue prices under the PDS for rice, wheat and coarse cereals (called "coarse grains") per kg would be Rs. 3, Rs. 2 and Re. 1 respectively. The Bill does not specify criteria for the identification of households eligible for PDS entitlements. The Central Government is to determine the state-wise coverage of the PDS (proportion of the rural/urban population). Then numbers of eligible persons will be calculated from Census population figures. The identification of eligible households is left to state governments, subject to the scheme’s guidelines for Antyodaya, and subject to guidelines to be “specified” by the state government for Priority households. The identification of eligible households is to be completed within 365 days. The lists of eligible households are to be placed in the public domain and “displayed prominently”. For children, existing provisions of the Anganwadi scheme (formally known as "Integrated Child Development Scheme") combined with the Mid-Day Meal Scheme, have been combined and re-introduced in the bill but now as a right. For children below 6 months of age, "exclusive breastfeeding" shall be promoted. For children in the age group of 6 months to 6 years, a free age-appropriate meal would be provided through the local anganwadi. For children in the age group of 6 to 14 years, one free mid-day meal would be provided every day (except on school holidays) in all government and government-aided schools up to Class VIII or 8th standard. For children suffering from malnutrition, meals would be provided free of charge through the "local anganwadi". Every pregnant and lactating mother is entitled to a free meal at the local anganwadi during pregnancy as well as up to six months after the birth of the child, along with maternity benefits of Rs. 6,000 in installments. Meal here refers to hot-cooked or pre-cooked and heated before its service meal, or take-home ration, as prescribed by the Central government: these meals have to meet nutrition norms. The entitlements of women and children are to be delivered by the state governments through schemes with guidelines prescribed by the Central Government. The Bill provides for the creation of State Food Commissions. The main function of the State Commission is to monitor the implementation of the Act, give advice to the states governments and their agencies, and inquire into violations of entitlements. State Commissions also have to hear appeals against orders of the District Grievance Redressal Officer and prepare annual reports. The Bill provides for a two-tier grievance redressal structure, involving the District Grievance Redressal Officer (DGRO) and State Food Commission. State governments must also put in place an internal grievance redressal mechanism which may include call centres, help lines, etc. The mandate under revised Model Citizens’ Charter, the Supreme Court Directive to ensure Fair Average Quality (FAQ), Food Corporation of India’s own commitment to these standards, there are many reports of procurement of poor quality grains, as was seen under the TPDS. The FSB despite committing in the Preamble, to “provide for food and nutritional security….by ensuring access to adequate quantity of quality food….” fails to address the mechanism to ensure “quality food”. Though the Bill duly takes note of lack of proper scientific storage facilities and the resultant rotting of food grains, as seen under the TPDS, and tries to revamp the situation by including provisions for creation of such facilities, it fails when it comes to implementation, again. No specific timeframe for creation of such facilities to avoid wastage of food grain has been laid down. There is absolutely no mention of any sort of enforcement mechanism such as imposing fines on states that fail to comply with the deadlines of creation of such facilities. The issue of effective usage of excess stock that cannot be stored has also not been elaborated upon. The Bill imposes an obligation on every state to ensure that everyone under its jurisdiction has an access to minimum essential food which is nutritionally adequate and safe. This means that the Bill will favour richer states since the food allocation will remain more or less the same despite current status. Hence, the most important concern relating to exclusion of many poor households as far as food security is concerned remains unaddressed. Door-step delivery of food grain at Fair Price Shops (“FPS”) within the first seven days of a month has been the recommended cure for resolving this problem. Although door-step delivery has been made part of the present Bill, there is no mandatory requirement regarding the time period within which it has to be done every month. The remedy for poor off-take is to ensure that the food grains reach the FPS within the first seven days. People who depend on daily wages will otherwise find it extremely difficult to procure food grains. The Bill envisages grievance redressal bodies from the district level, which goes upwards to forums at the State and national levels. The only body at the village/taluk level is the “Vigilance Committee”, which lacks any real decision making powers. To ensure that the bulk of the population in need of food legislation is covered, a narrow exclusion criterion is the need of the hour. Provisions for procurement and storage in view of a specific time frame should have been laid down. An attempt to empower the beneficiaries of the scheme by prioritizing decentralised procurement, scheduling the distribution of food grains within a certain date of the month, imparting real decision making powers etc. should have been made. The introduction of schemes like cash transfers, which are meant to replace food transfer, should not have been implemented against the wishes of the beneficiaries. The Bill should have listened to the voices of the real beneficiaries, rather than being just an attempt to satisfy the growing demands for better food coverage of the nation for electoral purposes.